I come from a land of bayonet-fitting light bulbs. In France, some light fittings are bayonet (called B22) but most are screw-in (small-diameter E14 or large-diameter E27). 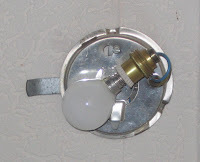 With the B22, the 240 volt Live & Neutral connections go via the 2 little solder blobs on the end of the bulb, while the metal casing may be earthed, with luck, or more likely just "floating". With the screw-ins, the 240v Live is connected to the single solder blob & the Neutral to the metal threaded case. That means that as you insert the bulb & screw it in, your fingers are almost certainly touching the metal thread, which is in electrical contact with what should be the Neutral line of your home electrical circuit. At that point, you want to be VERY sure that every previous owner, electrician, non-electrician & handyman has been careful to make all the wiring connections in your house in the right order. Otherwise you are holding 240 volts. If, as is more than likely, your light bulb is in some kind of mobile fitting (table lamp etc) then it will almost certainly have a 2-pin plug. That means that whether the bulb case is Live or Neutral depends on which way you happen to have put the symmetrical plug in the socket. Of course, you would never try to change a light bulb without unplugging the appliance, or cutting the power at the fuse-box, would you? With screw fittings, I certainly wouldn't! Don't forget that simply switching off is not enough. Who knows which wire the switch is in?